Creating, distributing, and promoting content is a job requiring ad hoc tools that can facilitate and optimize otherwise lengthy, tedious tasks. Here are our favorites, sorted by activity – they have all been 100% tested. Content Marketing is a multifaceted discipline that requires a large investment of time and energy to produce truly valuable content. For an article or blog post, the content research and writing phases alone can take several work days. For an ebook or a video course, the human and economic investment necessary is even greater. In order to optimize the effort/result ratio, there are many Content Marketing tools that fulfill the most diverse tasks – from helping to find topics to write about, to permitting the easy creation of graphical assets, to the scheduling of publications and the analysis of results. The problem is that trying them all out costs time, energy, and sometimes even money. That’s why we have put together a list of those that we have personally tested, and can recommend only those which are truly effective Content Marketing tools. Most of them are free, some are paid. Of course, the list is not exhaustive when compared to the resources available, but we hope that for this reason it is doubly useful. One of a Content Marketer’s biggest dilemmas is how to find interesting topics for their audience. What keywords should they build content around? We are well aware that information and SEO ranking needs are increasingly interconnected, which is why some of the tools which are traditionally dedicated strictly to SEO will prove to also be useful to those who create content. A somewhat obvious premise: in this context, Google is a leader. Given the amount of data it has, this is more or less unavoidable. For this reason, some of its tools (such as the keyword planner) are truly indispensable. 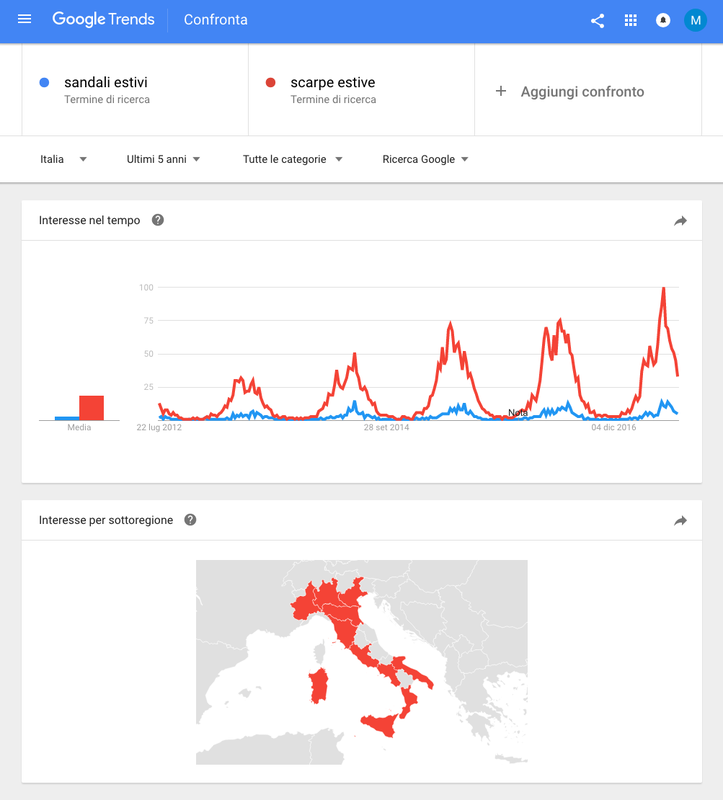 In addition to offering interesting tips on the most popular search topics, Google Trends offers the ability to compare search volumes for particular keywords, indicating the variation in time and correlation with any other ascending keywords. This is fundamental for understanding which keywords to target (“summer sandals” or “summer shoes”? ), and for identifying any critical seasonalities for content publishing. This Google tool is a godsend. 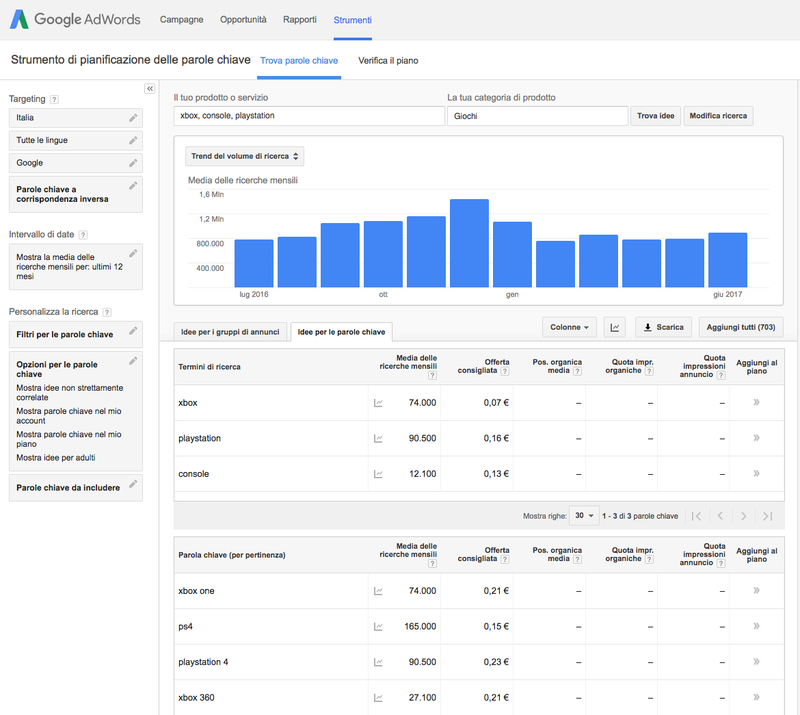 It was created as an AdWords tool, but is quite useful for discovering new keywords: simply by entering some basic info (some keywords, reference website, product category), the system provides the search volumes and also adds other related keywords. This system is complementary to Merlinox, which we will discuss shortly: if the latter works in a strict sense on the inserted query’s extensions, the Google tool reasons in a broader fashion, proposing semantically related keywords (for example, PS4 vs. Playstation) which are not necessarily lexically adjacent. We are all familiar with that sense of panic you get staring at the blank page when you open a new document on Google Drive. Well, Google can help us here too. All you have to do is click on the “Explore” icon at the bottom right to open a column that acts as a built-in Google search bar – yes, right inside the document. This is a little-known feature, but it is quite convenient for avoiding having to constantly go from one browser window to another. 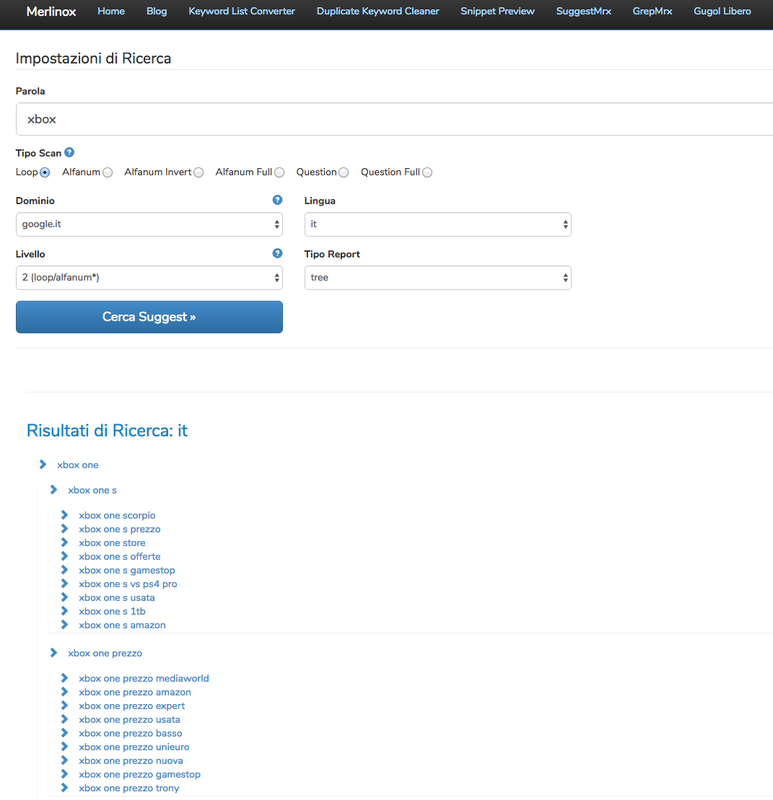 Just type in the query, et voilà. 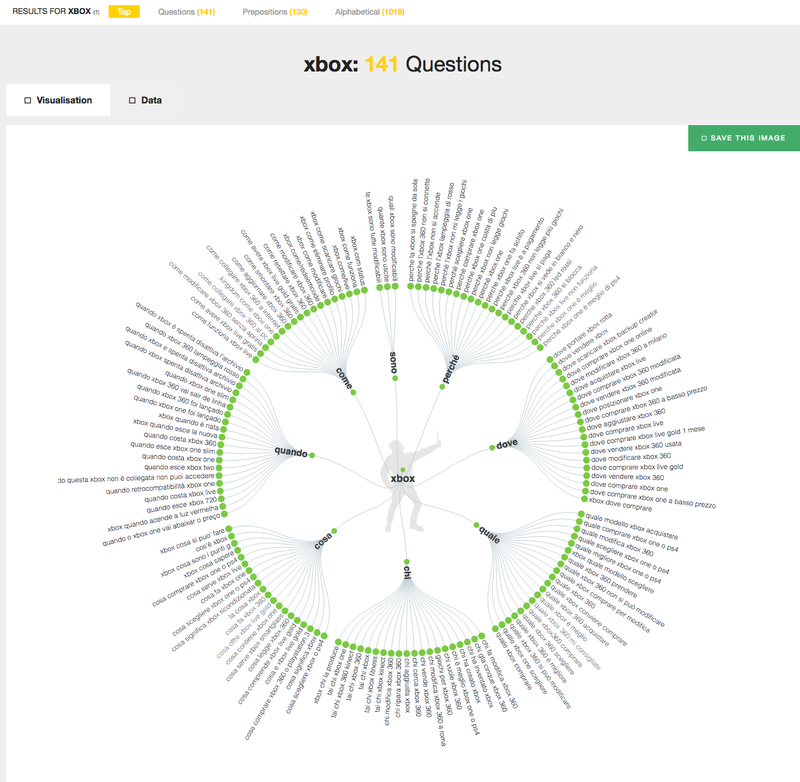 A friendly old man welcomes us to the homepage of AnswerThePublic, a dedicated tool for learning about questions submitted to Google by users in relation to a keyword. Simply type in the keyword, choose the reference language, and you’re done: the system will give you the questions Google has been asked in relation to that search, the accompanying prepositions, and the extended queries. There isn’t any volume data (so ​​it’s difficult to assign a weight to each question), but the convenient graphic view (also downloadable) compensates for this flaw. These two tools (with very similar interfaces and features) were created for SEOs, with the goal of providing the extensions of searched keywords. They are very convenient for identifying the most appropriate keywords to include in each blog post in order to maximize its SEO ranking potential. Lately I’ve preferred Merlinox, which I find clearer and more effective. To get the tree, remember to select 2(loop/alfanum) in the Level menu. Now let’s move away from the keyword area to take on another, equally important one. We all know how important it is to read, read, read and stay up-to-date on what industry blogs, various publications, and last but not least competitors write about. Feedly is a great discovery tool that lets you avoid jumping from one page to another: just enter the sources of interest, and the tool will collect and propose all the content in one place that your query produced, allowing you to organize it into folders and categories. 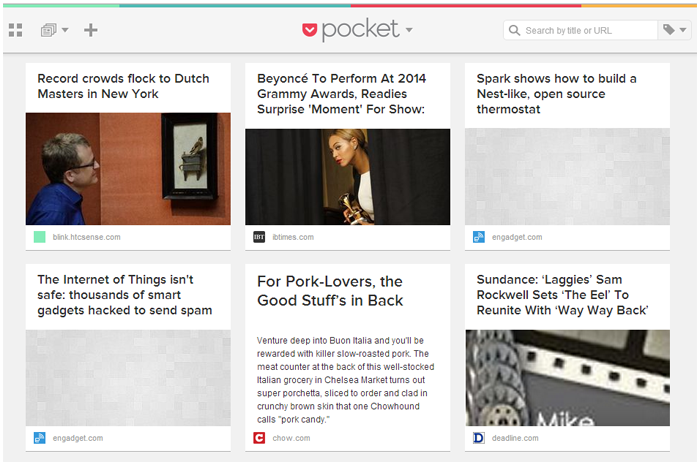 Pocket is, hands down, one of my favorite applications. It is designed for saving the interesting content you find online: in just one click, web pages can be saved in a type of personal bulletin board where you can assign tags and file the contents once you’ve read them. Evernote also offers a similar service, but pales in comparison. The presence of a mobile app and Chrome extension make it easy to find content on any device. You’ve decided on your topics and the keywords have been identified: how can you make your workflow linear and controlled, thereby avoiding missing any steps or deadlines? Some special tools come to our aid which let you plan projects for both yourself and for the team. Besides the following fundamental tools, I combine spreadsheets on Drive which I create specifically to meet my team’s needs, so that they can enter information they can’t find elsewhere. It may seem trivial, but Google Calendar is a great tool for planning work over time, as well as for setting appointments and deadlines. Thanks to the parallel display of different calendars (also distinguished chromatically), you can, for example, create a blog calendar, one for ebooks, another for webinars, and so on. The overall view will make what to do every day clear at a glance. Trello is a tool with exceptional flexibility. It consists of boards, columns, and sheets that can be 100% customized. Personally, I use it as a kanban board for the blog, creating a tab for each blog post, and moving the tabs along the columns that indicate the various work phases. There are actually an infinite number of ways to use Trello – even beyond the working sphere – let your creative side soar. If Trello is incredibly useful for seeing the progress of work (or at least for how we use it here), Asana is effective for always keeping an eye on each project’s tasks and subtasks. 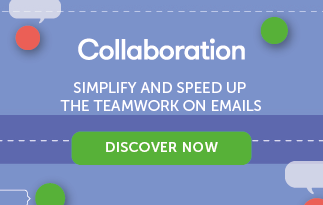 It lets you create projects, share them with specific teams, assign tasks and subtasks, set deadlines, and much more. A dedicated integration also lets you create Gantt charts – a fundamental option for complex or longer projects where one person’s tasks preclude or determine the next ones. 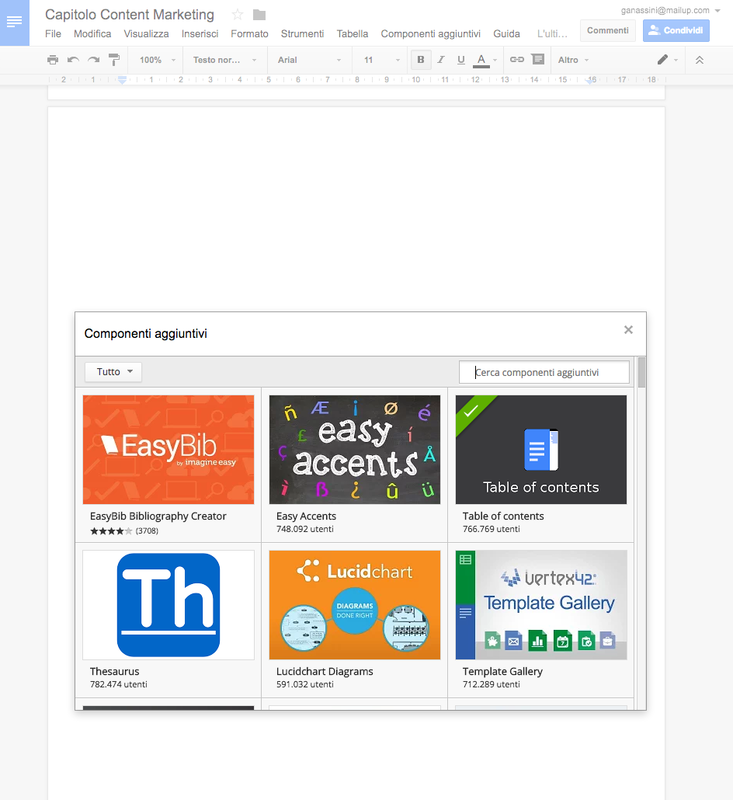 Many people don’t know that a simple blank page in Google Docs can be enriched with tons of additional features – you just have to know where to look for them! Just click on Add-Ins> Install Add-Ins from the menu at the top to open a type of store to use to install the most versatile features. My favorites? Better Word Count to facilitate the word count, and the Table of Contents, which adds a table of contents to the left-hand column that is populated and edited as I write. But there really is something for all tastes and needs. 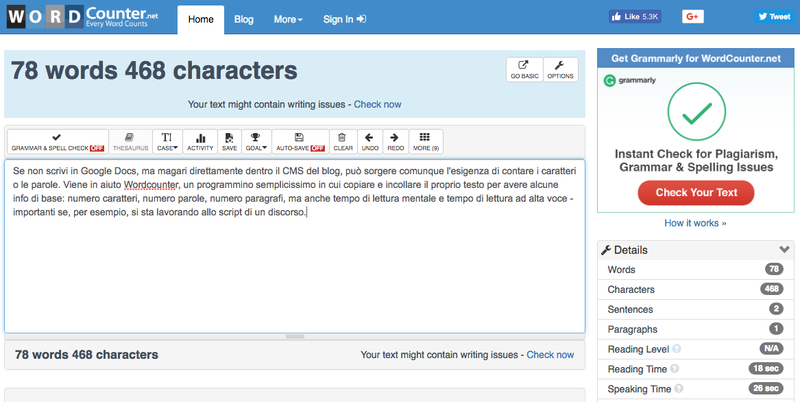 If you don’t use Google Docs to write your documents, but perhaps write them directly inside your blog’s CMS, you may still need to count characters or words. 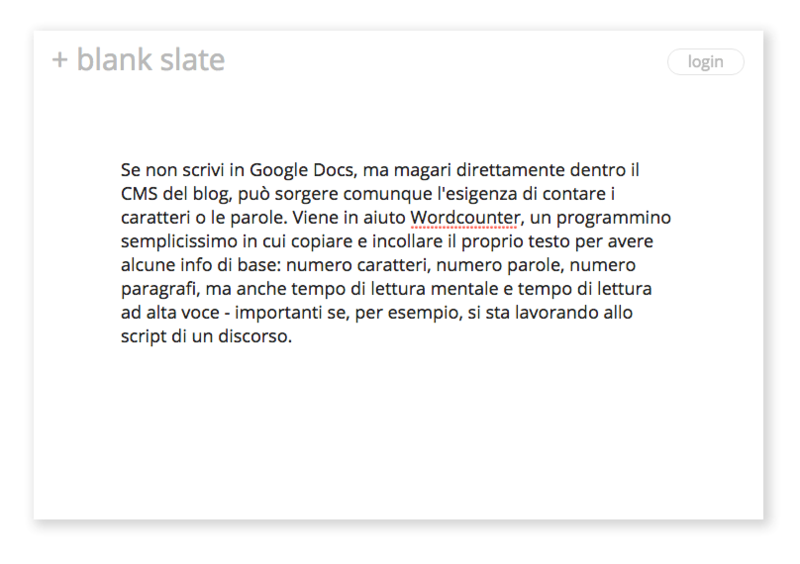 Wordcounter comes in handy for this task; it is a very simple program in which you copy and paste your own text to obtain some basic info: number of characters, number of words, number of paragraphs, but also mental reading time and vocal reading time, which are very important if you’re working on the script of a speech, for example. 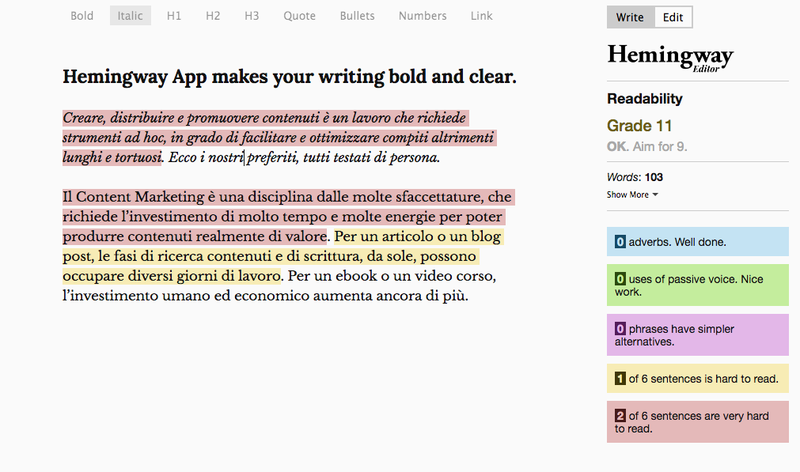 Get rid of distractions, unnecessary buttons, too many features, excessive formatting. Sometimes when it comes to writing, all you need is a simple blank page. This is what online apps like Calmly or Blank Slate offer – nothing more than a blank writing space that is completely empty and distraction-free, where you can concentrate on what really matters – finding the right words. Hemingway analyzes the sentence structure and recommends corrections for improving grammar, syntax, and readability. It is incredibly useful if you write in English; for other languages ​​it can still give useful suggestions about the length of sentences and the simplification of sentence construction. If you’re not overly confident about spelling and grammar in English, this app is a formidable ally. 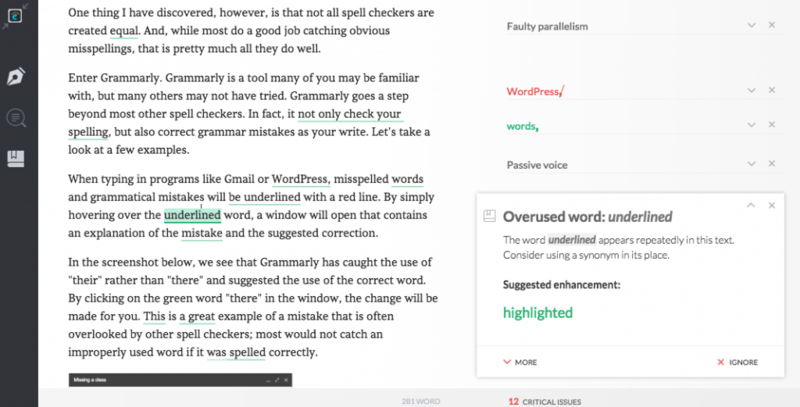 It checks grammar, spelling, repetitions, and syntax, suggests synonyms and even checks for plagiarism (if it finds phrases or paragraphs elsewhere on the internet, it reports them and suggests rephrasing or replacing them). In other words, it is a skilled proofreader that everyone would love to have working alongside them. Content Marketing is not only based on words, but also on visual, graphic, and entertainment-type content. The good thing is that you don’t have to be a designer or know about Photoshop (though, let’s face it, having your own personal graphic designer to commission GIFs and infographics to is the deep-down dream of any content marketer). All you really have to do is know the right tools for creating impeccable images, presentations, and infographics. Canva is a simple and intuitive platform you can use to make beautiful graphics that serve a variety of uses, all in just a few steps. For example, the system offers templates for social media, brochures, resumes, presentations, posters, book and CD covers, and so on and so forth. The vast library lets you choose between preconfigured and customizable models, or lets you create your project from scratch in total freedom. All the content can then be freely downloaded and reused. I must admit I’ve tried all the apps around that promise to transform simple images into perfect social channel posts thanks to the addition of text and other effects. Over tops them all. It’s easy to use, offers lots of effects/fonts/forms/possibilities, and unlike many other apps, it doesn’t attach its logo, even if you just use the free version. Even though it’s only available on your mobile, I’ve found it much easier and more convenient to use than many other desktop applications that do similar tasks. Photo editing on the fly, directly from your browser? 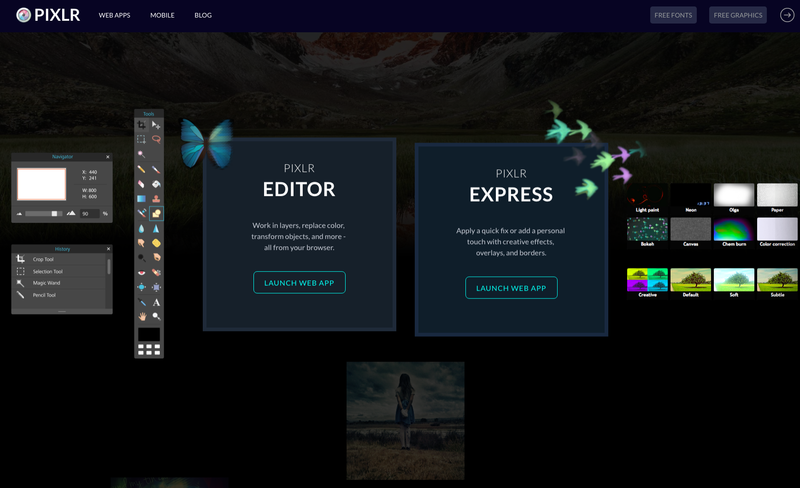 Pixlr offers two options: Editor, which is more complete and more similar to Photoshop, and Express, which is a faster, easier app for less elaborate editing such as filters, frames, and borders. It is excellent for those who don’t know much about graphic design but still want to take a stab at perfect editing. 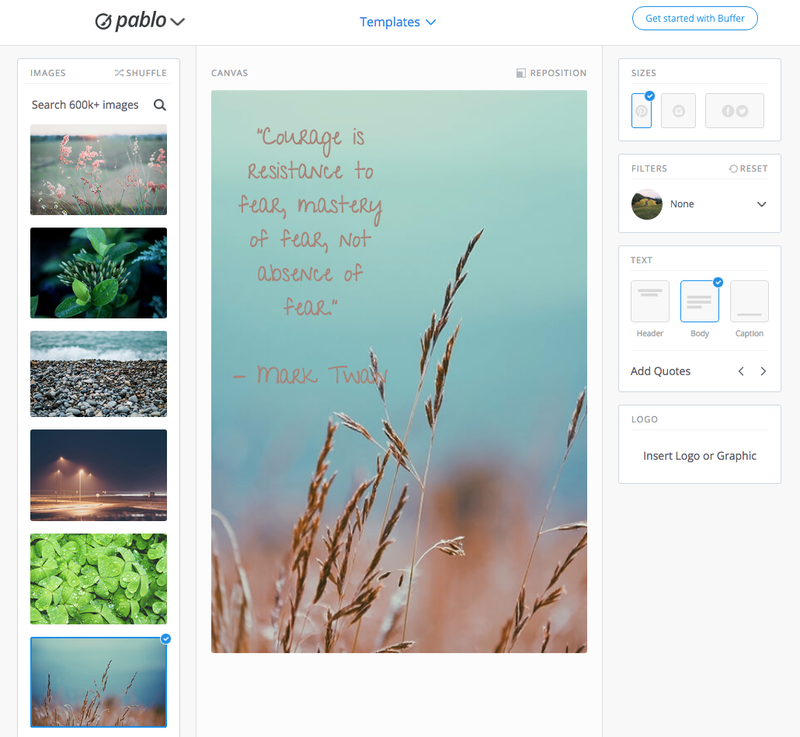 This tool was developed by Buffer, which we will soon address; Pablo is an image editor with a specific purpose: to create posts which are optimized for individual social channels in as little time as possible and as best as possible. So what does that mean? The editing capabilities are limited (resize, a few filters, text and logo overlapping), but the system lets you crop the images so they are already the right size for Instagram, Pinterest, or Facebook/Twitter. I especially like using Pablo for Pinterest, where the vertical format of photos is recreated every time. It also gets a thumbs up for the automatic citation generator, the free image bank (along with the ability to upload your photos), and for its immediate integration with the Buffer scheduler. Did you see a perfect blue dot on a website and want to use it in your graphics, but you don’t know how to replicate it? Or: does it always take hours and hours to get a company’s color palette right? ColorZilla is a Chrome extension that lets you obtain the hex code and RGB compositions of any color available on the web, simply by hovering over it with your mouse. 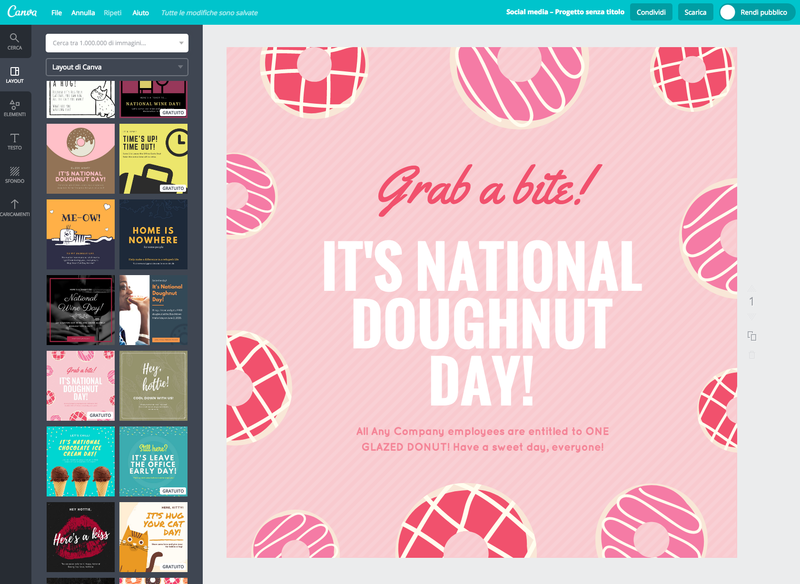 Animated GIFs are fun, easy to use, and very, very trendy (you can even use them in emails!). But where do you find them? Giphy is the top free animated GIF database; they are subdivided by category and can all be freely downloaded. All you have to do is find the right one to add a bit of extra movement to the posts for your blog and social pages. Presentations can be a nightmare to create. 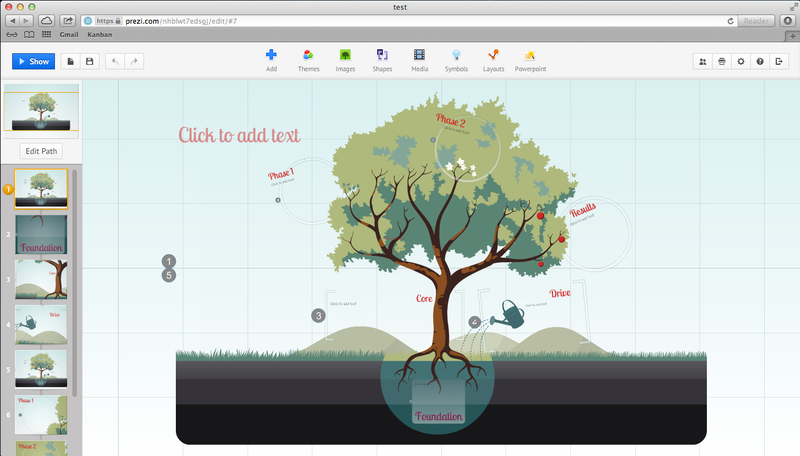 If you’re done with PowerPoint, Google Presentations just doesn’t cut it, and InDesign is beyond your technical skills, Prezi can be a good solution. The platform is full of templates and animation possibilities, giving even the simplest presentation an extra touch that a classic PowerPoint file definitely lacks. Infographics are great, but who knows how to create them? Anyone (more or less) with Piktochart. 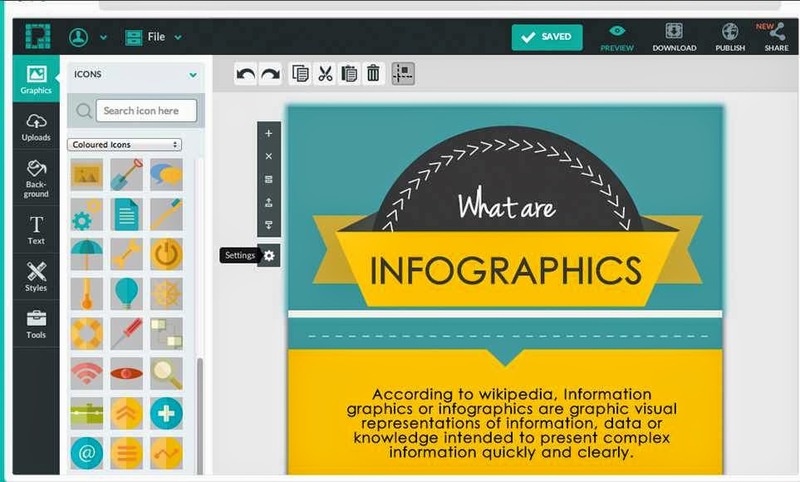 Its operation and interface are similar to Canva (see above), but with a special focus precisely on infographics. Needless to say, it still takes a lot of work to create a proper infographic, but at least you don’t need a professional graphic designer. 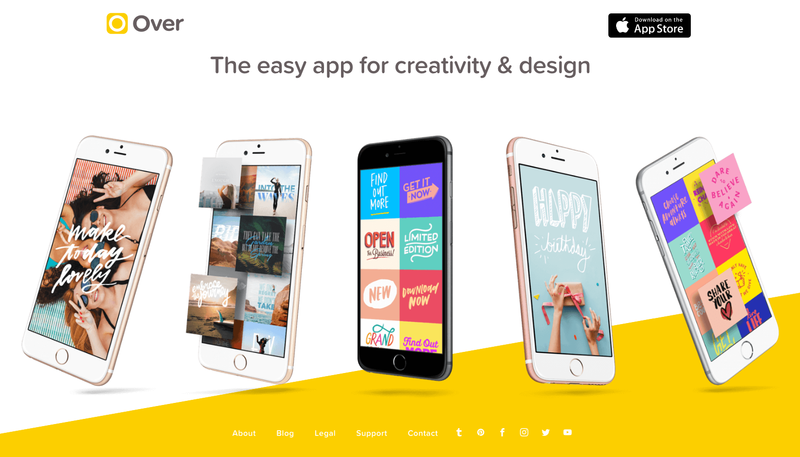 Venngage is an easy to use website where the most design-inept can create stylish content for websites, presentations, ads, social media use and much more. There are templates for a wide range of projects including infographics, reports, posters, promotions and social media posts. Design Wizard is a graphic design tool that will allow you to create wonderful designs in minutes. 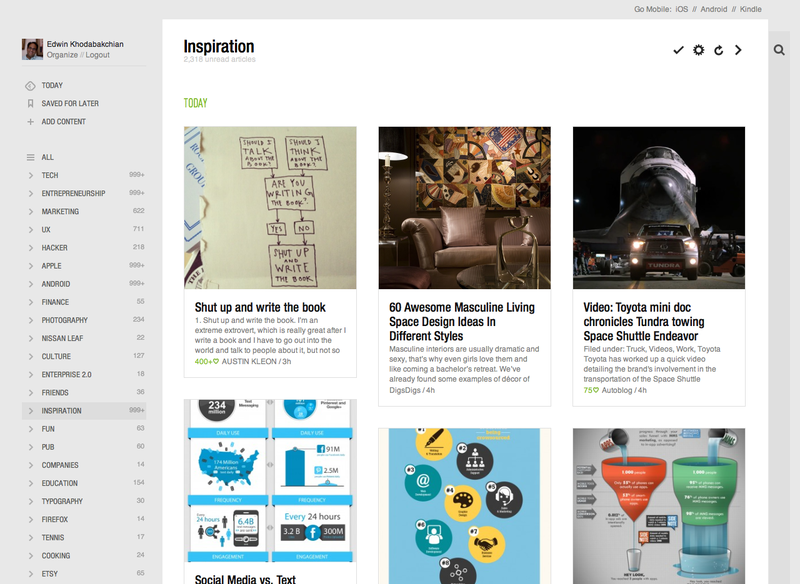 The website boasts over 1 million images and thousands of templates on several topics that you can choose from. One of the standout features on Design Wizard is the magic resize button that will allow you to change the size of the template in a matter of seconds while you are creating your design. You can also upload your own images and create your personalized designs for free in seconds. As well as this Design Wizard has integrations with Hubspot, Marketo and Intercom. Your contents are ready, finally. It’s time to publish them, share them, and generate as much traffic as possible around them. You can see to all the publishing on your own, of course, but at the cost of poor organization and guaranteed stress. 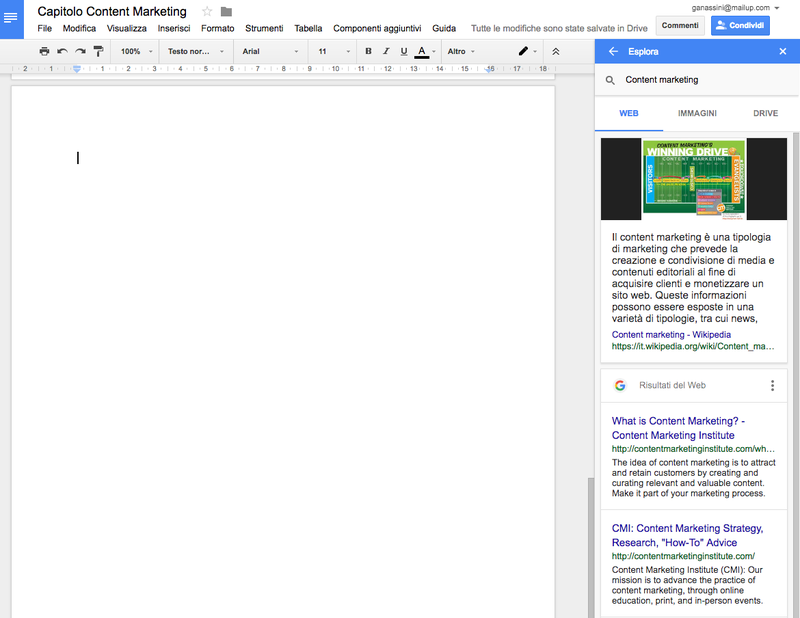 So here are some Content Marketing tools to help you best plan your releases and publications. 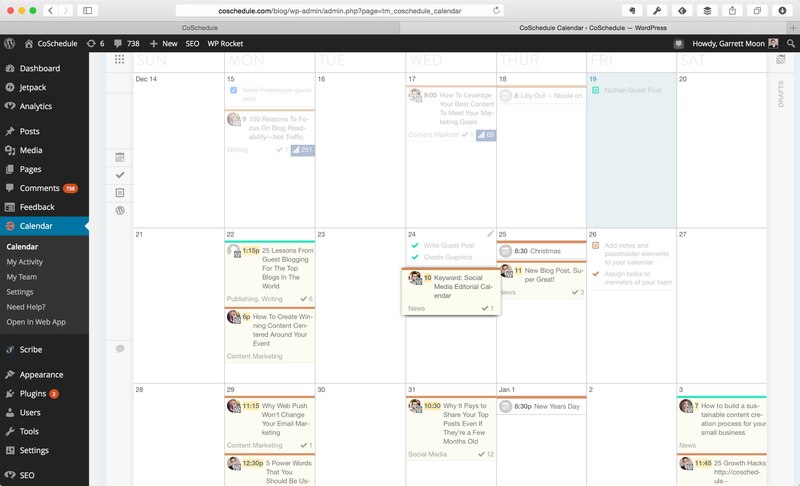 Lots of people use Hootsuite to schedule their social channel posts. 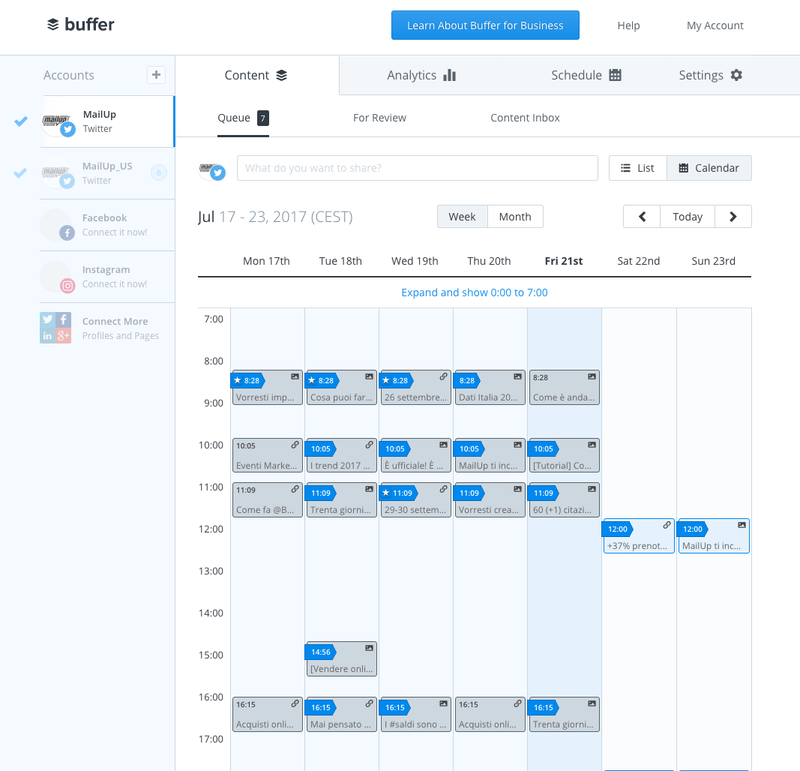 It’s a question of taste: I personally greatly prefer Buffer (already mentioned earlier in relation to Pablo), which combines extreme intuition with a convenient calendar interface, the possibility to shorten links directly on the platform, and useful analytics. There is a free version, but it has several limitations: I suggest at least paying for the $10/month version, which unlocks some useful features (such as the calendar view and the ability to connect multiple social accounts). CoSchedule is an exclusively paid tool that will revolutionize the way teams think, publish, and manage content for social pages and blogging. It is full of integrations (for example with WordPress, Tumblr, and the major social channels) to allow both individuals and teams to schedule content publishing and always keep an eye on what the rest of the team is doing. It’s probably not necessary for very small teams, but is definitely a sensible investment for larger marketing teams that work a lot with Content and Social Media Marketing. Alternatives to unified calendars: if you don’t like having a single calendar, you can always schedule social posts with ad hoc platforms for each one. My favorites are TweetDeck for Twitter (free), the native scheduling system of Facebook (free for pages), and ScheduGram for Instagram (from €16/month). 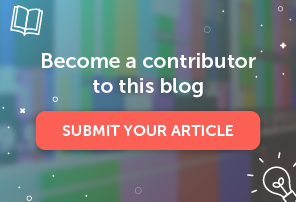 Your blog post might be great, but if no one reads it? Properly delivering content through Email Marketing is a great way to ensure its visibility, traffic, and the return on investment. The BEE editor included in the MailUp platform is perfect for creating beautiful emails without having to enter a single line of code. 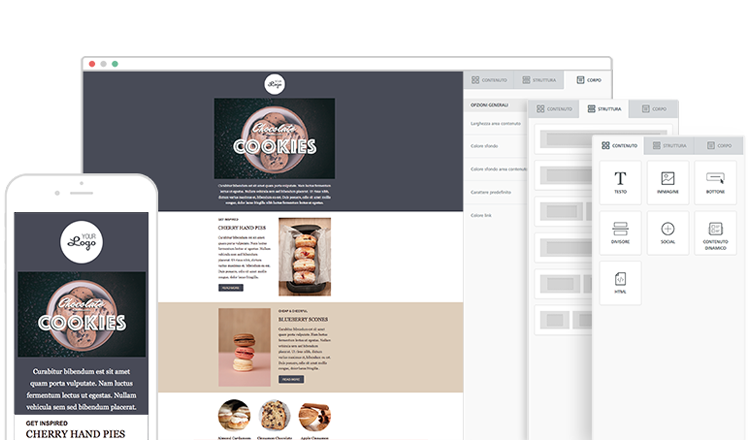 It is a drag & drop tool that creates newsletters which are already optimized for mobile: it’s ideal for giving maximum exposure to content that you’ve worked on for days or weeks. Have you created a wonderful presentation and would like to see it circulate beyond the event you made it for? 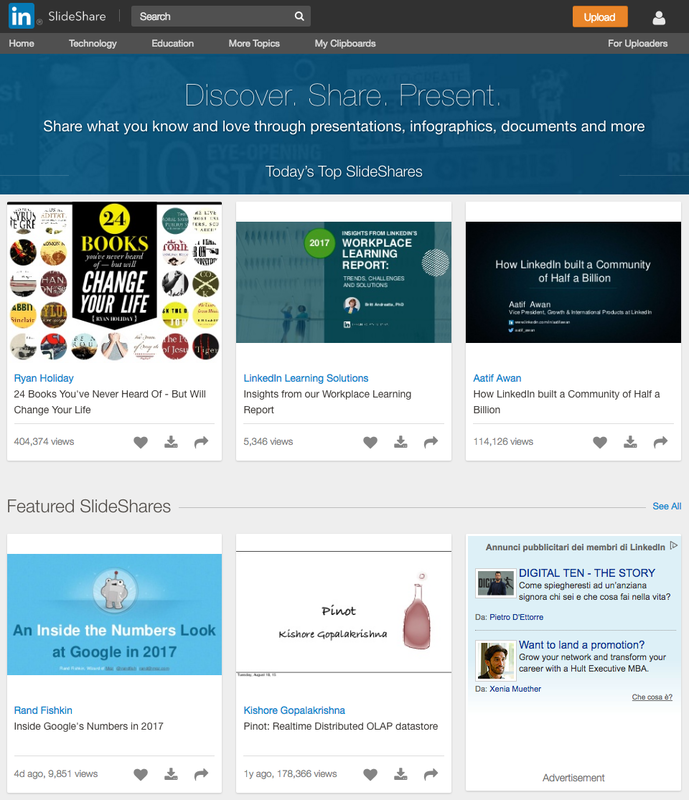 This is where SlideShare comes in: you can upload your presentations and leave them available to the public. It’s all indexed: if you choose the title and description well, you’ll find that it will bring qualified traffic to the website. The results analysis phase is critical for understanding the effectiveness of the Content Strategy you put into effect. Are your blog posts generating the desired traffic? Are your ebooks getting the downloads you hoped for? 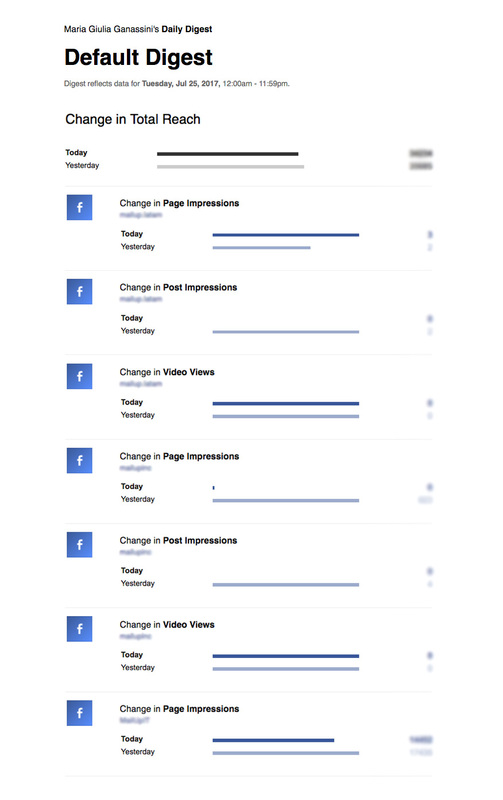 How many clicks do you get on each social post? Knowing these data is easy if you use the right tools. 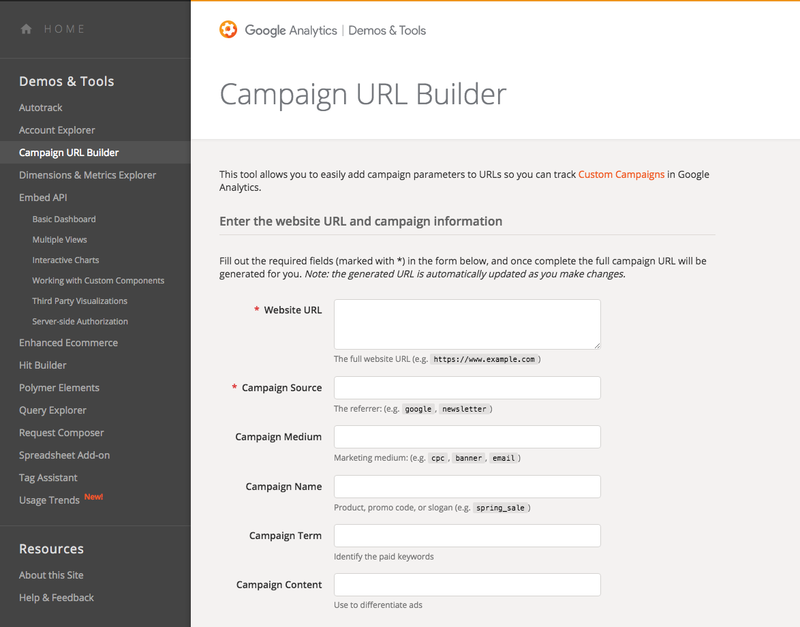 This tool from Google offers a guide for building tracking (also known as UTM), which is indispensable to Google Analytics for correctly tracking and analyzing traffic. Just enter the source (such as a blog, website, or Facebook page) and all the additional fields you find useful, to then find them in your Analytics. Analytics is any marketer’s bible – including, of course, the Content Marketer. In the section Behavior> Site Content> All Pages you’ll find the traffic trends of your website or blog over time. You can refine your analysis by inserting a secondary dimension, for example Source/Medium to split the traffic sources according to specific content (as long as you have filled in the above-mentioned UTM correctly! ), or you can compare traffic with the previous year or period. Of course, this is not all. The potential of Analytics is virtually endless: if you have never used it, you’ll find a useful guide for your first steps here. Bitly is useful for two reasons. First of all it’s a link shortener – a tool that shortens long URLs into a mini-format url for the benefit of user experience (look at what happens, for example, in the address bar if you click on this url: http://bit.ly/2vYh2DC). 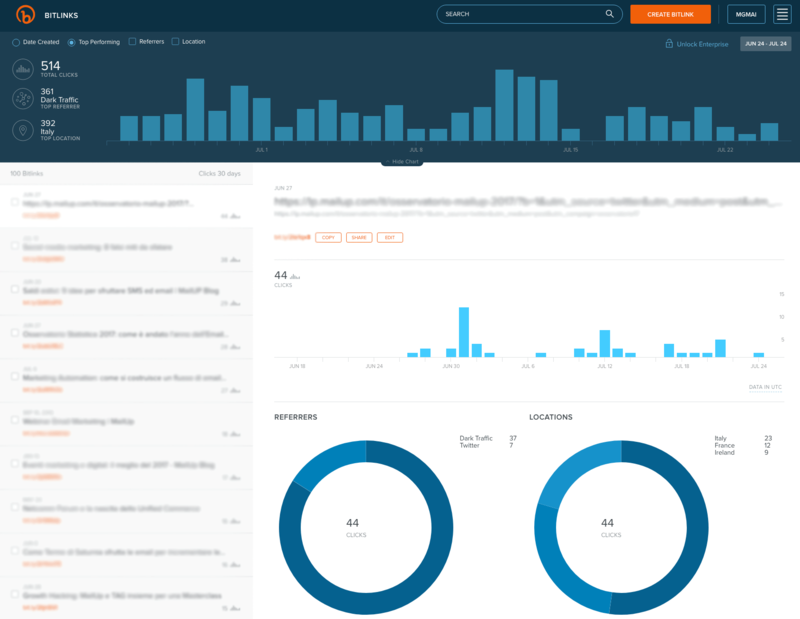 In addition, Bitly performs a series of analyses on its shortened links, such as how many clicks they have received, how the clicks are distributed over time, where the clicks come from, and so on. This basic information is useful for complementing (more detailed) Analytics. Social media channels are essential for conveying your content, and they require close monitoring that’s just as important as what you do on your website or blog. 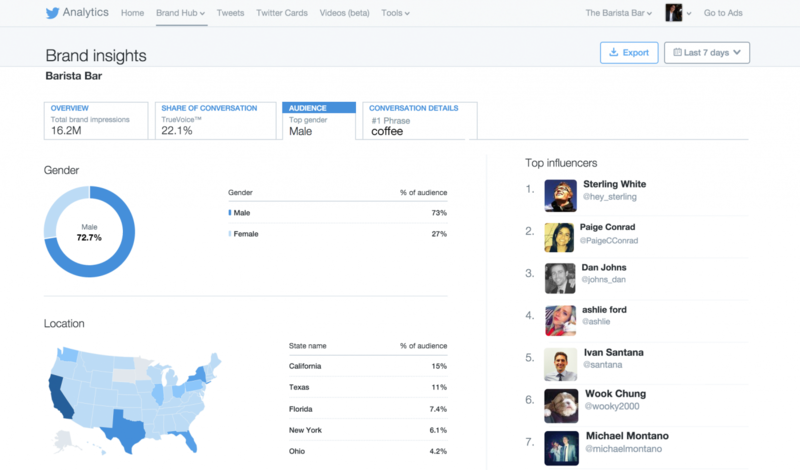 In addition to the popular Facebook Insights, it is good practice to regularly consult Twitter Analytics as well (full of information regarding both the brand account and the reference audience) and the other social analysis tools. For Instagram, the best is undoubtedly Iconosquare. If you’ve been familiar with SumAll for a while, you know that it has changed its image and use several times over the years. It went from being a free platform to a paid one, then back to being free with a completely different business model, as its CEO explains well in this post. Today, SumAll is an aggregator that provides insight into the various social channels in a convenient daily or weekly email format. The emails are definitely less articulate and effective than the charts it offered in the past, but they are still useful. Working in Content Marketing goes far beyond simply writing a blog post. You must organize and optimize resources, which fundamentally requires using the right tools. We hope this list of Content Marketing tools – all personally tested – will prove useful: any suggestions are welcome in the comments!